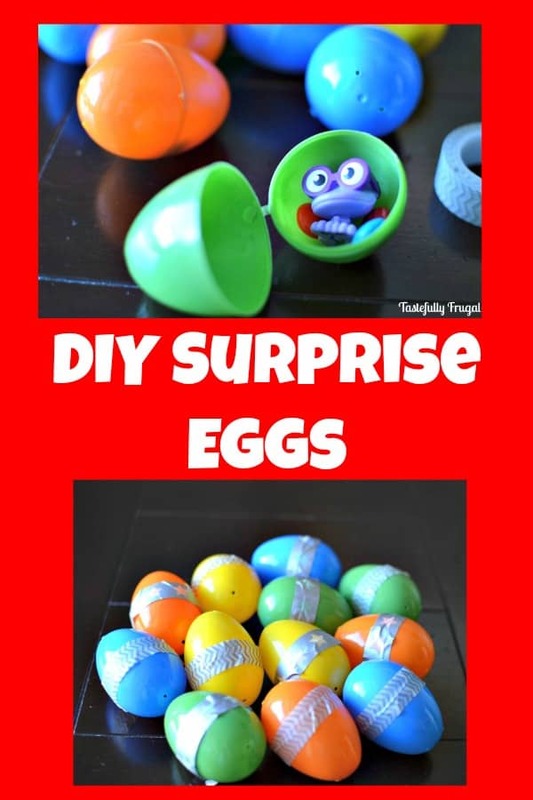 If your kids watch the Kinder Surprise Egg videos on YouTube (and beg for them non-stop) you will love today’s post! Have you seen (or heard in the background) the YouTube videos for Kinder Surprise Eggs? If you have a preschooler (or toddler) who steals your phone to watch YouTube its inevitable that you have. Apparently they are hugely popular everywhere in the world, other than in the US. They are banned here because of the choking hazard. What they are are plastic eggs with popular toys inside (Disney, Hello Kitty, Bubble Guppies, Barbie) covered in chocolate. I don’t know if there is subliminal messaging played in the music for the videos or what; but my boys LOVE watching those videos! I don’t mind if they watch the occasional YouTube video, but the problem comes when they start asking for things that I can’t (or won’t) get them. The surprise eggs fall in the can’t category. I did look into and considered ordering some from overseas, but I am not paying almost $3 for a chocolate covered toy egg plus shipping to get it here; no way José! But I don’t like disappointing my boys either so I started thinking how could I make these eggs for them. 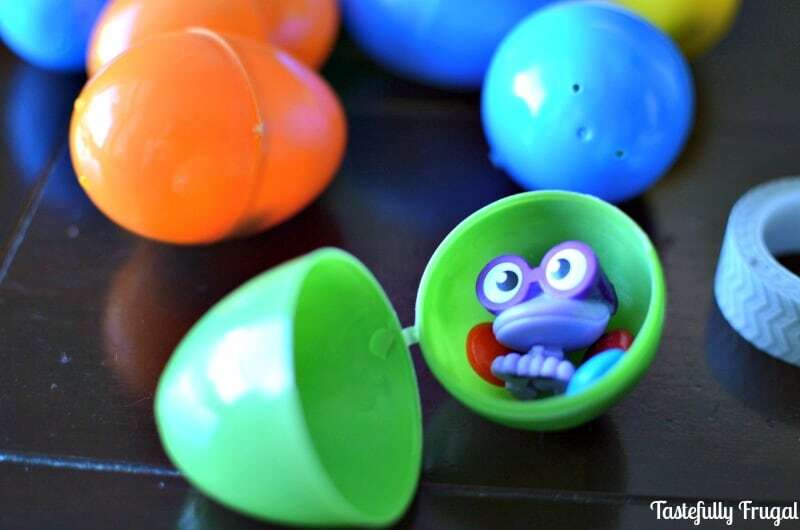 As I watched the videos I realized they don’t really focus much on the chocolate, in fact they just toss it aside, so I knew that my boys would be happy with just toys in an egg. I kept our Easter eggs from last year (I’m a hoarder I know) and they have so many little characters we have collected over the years that they never play with I knew it would be like getting a new toy. To make it more like they were unwrapping the eggs I taped them shut with some washi tape. To say they loved them would be an understatement. They were ecstatic opening up each egg and seeing their “new toys”. 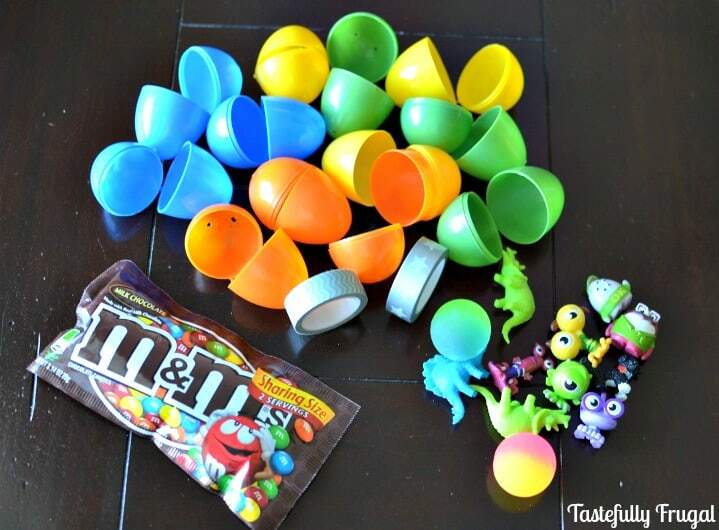 The first few times I made them (and I have made them almost every day for the last few weeks) I just put the toys in but as I was going through our cabinets one day I found some Halloween candy that was forgotten so I included M&Ms in them a few times; that was an even bigger hit! So if you have little ones, even if they haven’t seen the Kinder Egg YouTube Videos, surprise them one day with a batch of these. You will be the coolest mom ever! 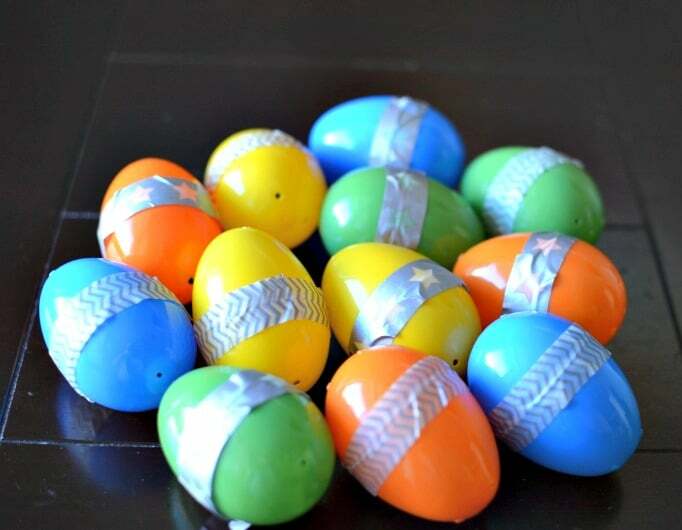 Put toys and candy in eggs and seal eggs with washi tape. Do your kids watch YouTube? What videos do they watch over and over again? Great idea! And I hear you about wanting all the “great” things they are seeing. Thanks for sharing at Motivational Monday! Hope you will link up again tonight. My grand daughter watches YouTube and LOVES? ?the surprise eggs. (That’s an under statement) I’m going to make her some for her 4th Birthday May 16th…I’ll post pictures when she opens them. Thanks for your help.